There are a lot of midsize sedans on the market, and it's no surprise that we think nothing beats the German-engineered Volkswagen Passat. Not only do we offer a wide selection of new VW Passat sedans in our huge inventory of the latest Volkswagen models, we also help you with the research when looking for your next new midsize sedan. In this VW comparison information page, we look at the stiff competition from Toyota. How does the new 2018 Volkswagen Passat compare to the 2018 Toyota Camry? Find a preview below, and be sure to check out our frequently updated new VW special offers to save even more on your next upgrade. We're conveniently located at 5202 Leary Avenue Northwest, Seattle, WA 98107, and it's easy to schedule a test drive online with Carter Volkswagen in Ballard. The designs of the 2018 VW Passat and the 2018 Toyota Camry are quite different. While the German-engineered Volkswagen Passat presents an air of sophistication and confidence, the bold and aggressive look of the new Toyota Camry offers a very different impression. However, there's more to choosing your next new midsize sedan than the appearance. This is where we find significant advantages in the more-affordable Volkswagen Passat over the Toyota Camry. For example, the new VW Passat comes standard with an 8-way power adjustable driver's seat, which is a level of comfort and convenience that will cost even more as an upgrade in the Toyota. What's more, you'll enjoy superior cargo and passenger space inside the new Volkswagen Passat. These are just a couple examples of how the new 2018 VW Passat is designed to give you more for your money than the new Toyota Camry. When it comes to performance, the spec sheets suggest that the new 2018 Volkswagen Passat and the Toyota Camry are similar. However, the numbers don't necessarily tell the whole story. The new VW Passat comes standard with a turbocharged engine that produces the same amount of torque as the Toyota Camry, but with a smaller engine. It's also important to consider which car will perform reliably down the road. Toyota enjoys a great reputation for quality and reliability, but it's the German-engineered Volkswagen Passat that comes with enough confidence to be backed with a 6-year or 72,000-mile bumper-to-bumper warranty. 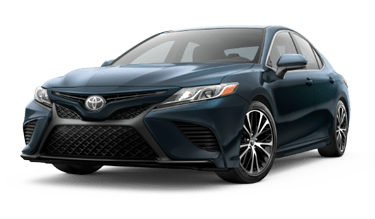 The engineers at Toyota only have enough confidence in the Camry to back it with a basic warranty that's half that of the VW Passat. Come see us to experience the performance of the new VW Passat during a test drive at Carter Volkswagen in Ballard. At Volkswagen, your safety is a top priority, and the new 2018 VW Passat is a great example with seven stability-enhancing features, a rigid safety cage, and active safety features. The new Toyota Camry is also recognized as safe, but does its safety features justify the higher price tag? Both models are available with driver assist features, but the technology in the new Volkswagen Passat continues working for you even if a collision proves unavoidable with the Intelligent Crash Response System. This is a level of safety technology that's not found in a Toyota Camry, and that's just the beginning. If you ever find yourself on the side of the road in need of help, every new 2018 Volkswagen Passat comes with 3 years of included roadside assistance, which is more than you'll get from the Toyota Camry.